Wilfred Edward Salter Owen was born a Shropshire lad on the 18th March 1893, the eldest of four children – sister, Mary and brothers Harold and Colin. Wilfred was educated at the Birkenhead Institute and then Shrewsbury Technical College. He did pass his matriculation exam for the University of London, but not securing a scholarship his parents could not afford for him to attend. Instead, he attended classes at University College, Reading and worked as a lay assistant to the Vicar of Dunsden. He taught English and French in Bordeaux, privately, from 1912. His poetic influences came from the Bible and John Keats and when war was declared he considered joining the French army, but later decided to return to England where he joined the Artists' Rifles for officer training and received his commission as second lieutenant in June 1916 with the Manchester Regiment. After a number of traumatic experiences Wilfred Owen was diagnosed with neurasthenia (shell shock) and was sent to Craiglockhart War Hospital for officers, in Scotland. Here he met Siegfried Sassoon and that relationship transformed Owen's life. One of the most outstanding pieces of Great War literature has to be Pat Barker's Regeneration Trilogy where both Owen and Sassoon are brought to life. Barker uses one of Owen's corrected poems, Anthem for Doomed Youth, to create a conversation between the pair in Regeneration. The third book, The Ghost Road, tells of Owen's tragic death on the 4th November 1918, just one week before the Armistice was signed. On the 1st October 1918 Owen led units of the Second Manchesters to storm a number of enemy strong points near the village of Joncourt and was awarded the Military Cross for his courage and leadership, but was not gazetted until the 15th February 1919. Owen was killed in action, aged just 25, on the 4th November 1918 during the crossing of the Sambre-Oise canal and was promoted to the rank of Lieutenant the day after his death. His parents received the sad news on Armistice Day. He is buried in Ors Communal Cemetery, France. His poetry lives on and some of his famous works are used in many different ways; in schools, on memorials, as insignias. Only five of Owen's poems were published before he died. 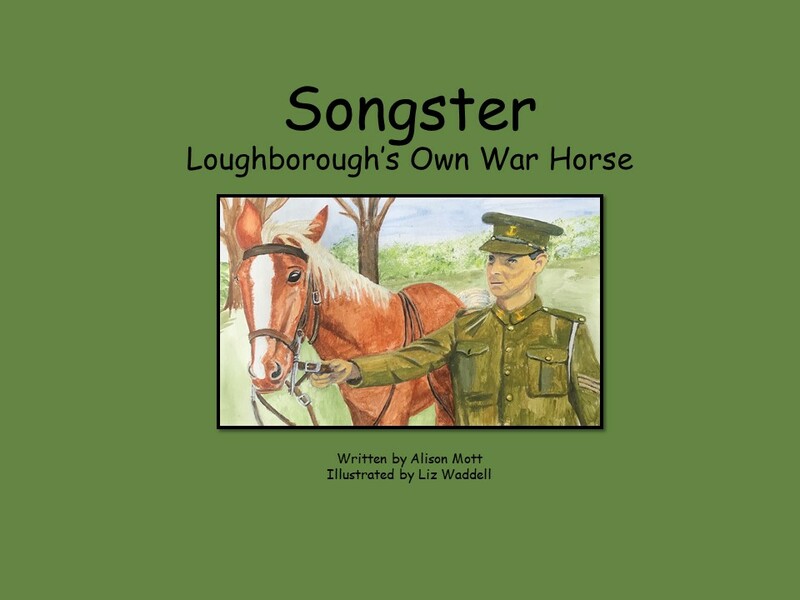 Loughborough Carillon museum has released a children’s book about Songster, Loughborough’s own war horse. The book has been written by Alison Mott and beautifully illustrated by artist, Liz Waddell. The book is a wonderful way to share Songster’s fascinating story with a modern-day audience. Alison and Liz worked with pupils at Maplewell School in Woodhouse Eaves and Rawlins Academy in Quorn, to get ideas for bringing the story to life, and a picture book was decided upon. The Carillon Museum was given a grant by Charnwood Borough Council to cover some of the costs of producing the book. Songster’s story is to be officially launched during the Armistice commemorations in Queens Park on the 11th November 2018. It will be available to buy beforehand from Charnwood Museum, Waterstone’s in the Market Place and from the Carillon Museum's website. The team behind the book are hoping to run workshops about it in schools as well as during the Loogabarooga Children’s Book Festival in October. On the 27th January countries around the world will commemorate the Haulocaust. Today I was privileged to be able to attend a service, led by Rabbi Dvir Baris, for Holocaust Memorial Day. The service was so brilliantly moving I would like to share some of it here to respect the memory of those killed in the Holocaust and other Genocides. Between 1939 and 1945, the Nazis and their collaborators murdered six million Jews. Of these, one-and-a-half million were children and teenagers. Whole families died and the names of many Jewish people still remain unknown. When the Germans invaded Nagyvarad, a small town in Hungary, Eva Heyman was just thirteen. She wrote a diary and on the 19th March 1944 she recorded: "The Germans have come!" On the 10th May she wrote that: "The punishment for everything is death." Later that month, on the 30th May, she wrote: "I don't want to die. […] I can't write any more, dear diary, the tears run from my eyes, I'm hurrying over to Mariska." Eva was caught along with her grandmother and grandfather, and sent to Auschwitz-Birkenau extermination camp where she was murdered. War poet, W. H Auden, wrote Refugee Blues from the point of view of a Jewish refugee who had fled Europe for America. The poem, published by the Holocaust Memorial Day, is read here by Sheila Hancock. On Holocaust Memorial Day other groups of people who were persecuted and murdered are also remembered: Roma and Sinti people (gypsies), disabled people, gay people, Jehovah's Witnesses, political opponents, to name but a few. Also remembered are the millions of men, women and children murdered in the genocides which followed in Armenia, Cambodia, Rwanda, Bosnia and Darfur. During World War 1 the Ottmanian Empire conducted systematic extermination of one-and-a-half million Armenians, mostly citizens within the Ottoman Empire and, more latterly, the Republic of Turkey, these massacres continued until 1923. Between April and July 1994, around a million people were murdered in the Genocide in Rwanda. Hutus were told that it was their duty to exterminate the Tutsis people and the Rwandan government gave support to the death squads (the Interahamwe). Local officials rounded up victims and created places for their slaughter. What responsibility to we have to use the power of our words for good today? Labels: Eva Heyman, Halocaust Memorial Day, W H Auden.